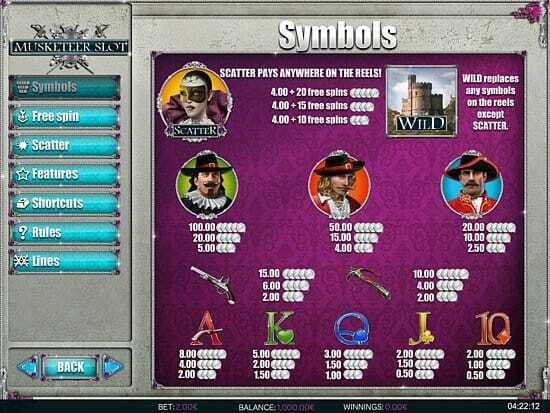 Here's a superb new slot games online from iSoftBet. All for one and one for… the win! Join this merry band of moustachioed soldiers in this gallant online slot full of great gameplay and top class prizes. From iSoftBet it’s guaranteed to be an action-packed experience. Check out our entire list of Online slot game now. iSoftBet is a leading gaming developer well known for creating action packed online titles including the popular Platoon games. ISoftBet is rapidly becoming one of the top developers in the online casino field. Get the most out of Slots promotions when you play! This is a truly epic online slot, inspired by the classic novel by Alexandre Dumas it will become a firm favourite of any fans of the swashbuckling adventures of Athos, Porthos and Aramis. 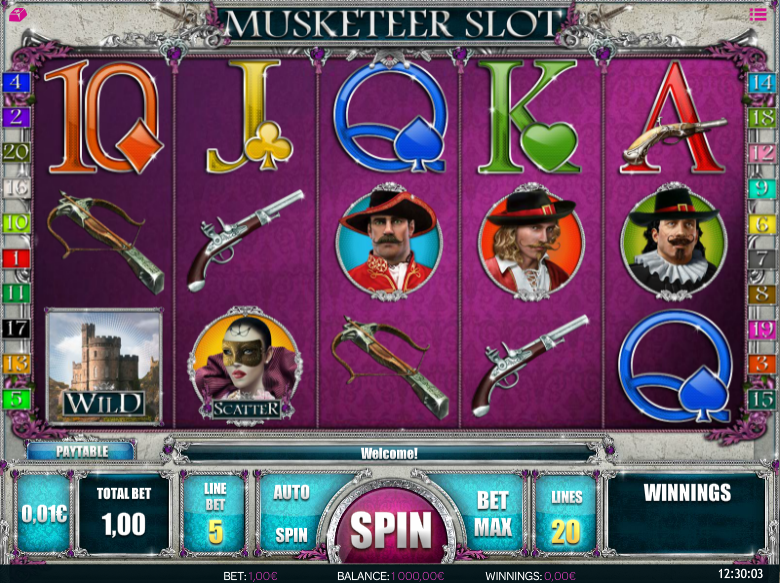 With iSoftBet games you always get impressive graphics and Musketeer is no different, bringing to life the characters, icons and gameplay. It’s relatively simple to get started with this game thanks to the straightforward controls allowing you to choose the size of your wager for each spin. Once you get started there’s some handsome rewards to be had from finding 3 or more of the musketeers on one payline. 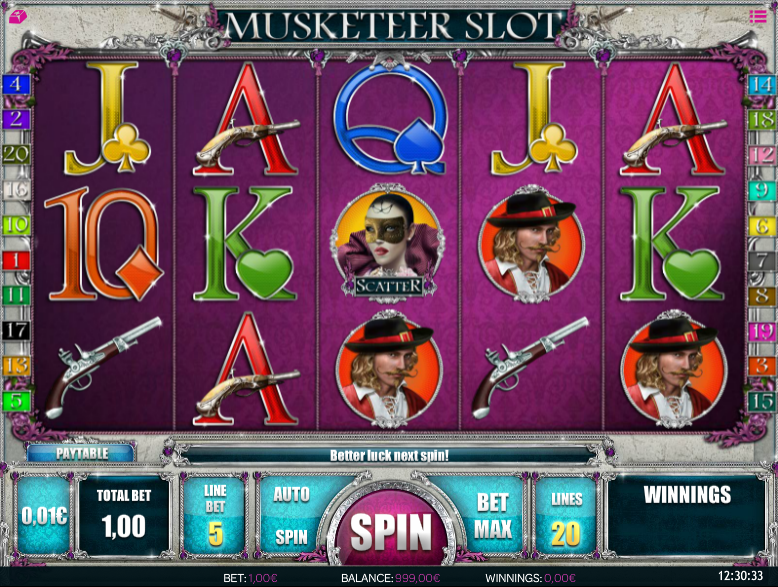 The biggest musketeer win will bag you over 5,000 credits, you’ll receive that for getting 5 of the long dark haired musketeer in a row, the next best is 2,500 for getting 5 of the blonde musketeer and the short haired musketeer will get you 1,000. 5 musket symbols will get you 750, 5 crossbows 500 and the playing cards 100 – 400 credits. Scatter – The scatter in this game is an enigmatic masked female figure. She’ll reward you with a win when you locate 3 or more of her anywhere on the reels. Find 3 and you’ll get 10 free spins, 4 and you’ll get 15 and 5 and you’ll get 20. As an added bonus, a random multiplier between 2x and 10x will be added to all wins you land in these free spins. Wild – The wild in this game is a castle symbol and it’s one that can make a big difference to your game. This heroic symbol can replace all others (bar the scatter) to complete winning combinations for you. It can also appear randomly on any normal spin to turn any of the reels into an extended wild. Taking these moustachioed marvels for a spin is enormous fun. Anyone that’s read or watched their story, or even fans of the 80s cartoon classic Dogtanian and the Three Muskehounds will find this a really engaging and nostalgic online slot. The graphics are great, the gameplay is smooth an easy to get to grips with and the search for the masked femme fatale will keep you on your toes. She, and the Castle symbol hold the key to Musketeer glory!